General Motors says it will start selling a Chevrolet Impala sedan next year that runs on both natural gas (CNG) and gasoline. The giant automaker says the Impala will be the only factory-produced full-size car that runs on both fuels. It says both fuels are needed because there are few natural gas filling stations in the US. We have quite a good network of compressed natural gas stations in Klang Valley, so, this could be a good option provided no compatibility issue. 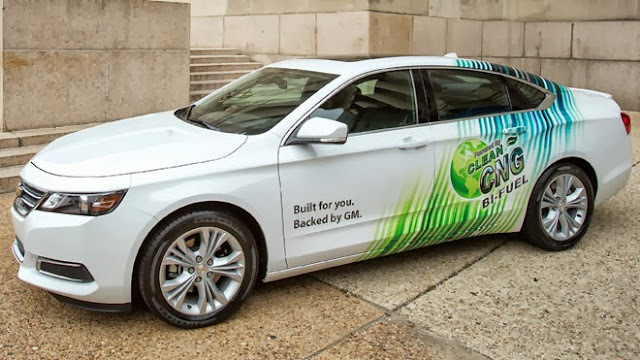 General Motors chairman and chief executive Dan Akerson unveiled the new dual-fuel Chevrolet Impala at an energy summit in Washington this week. The 2015 model year sedan will be offered to customers beginning in mid-2014. GM says it will be the only manufacturer-produced full-size bi-fuel sedan in North America, taking advantage of abundant US gas supplies. The powertrain will switch "seamlessly" from compressed natural gas to gasoline at the touch of a dashboard button. The car will have a range of up to 500 miles (800 kilometers), and its ability to use both fuels will reduce user fears over replenishing the tank in a natural gas-only vehicle. The largest US automaker, pointed to natural gas as a cleaner-burning transportation fuel compared with petroleum products and its significantly lower cost than gasoline at current prices. TheGreenMechanics: GM didn't reveal the new Impala's price but as a reference, gas-powered Impala starts around $28,000 (approx. RM88,400). Pretty affordable at dollar-to-dollar conversion but with our vehicle import duties and tariff in place, you are looking at double that figure to own one in Malaysia.